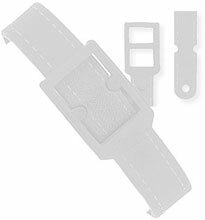 Brady Luggage Accessories - White Plastic Post & Notch Textured Luggage Strap, 7 3/8 x 3/8" (187 x 9 mm). Quantity of 500. The Brady 2430-2018 is also known as Brady People ID	2430-2018	or 24302018	.